What determined the design of the Old First Church? What did Lavius Fillmore consider first? 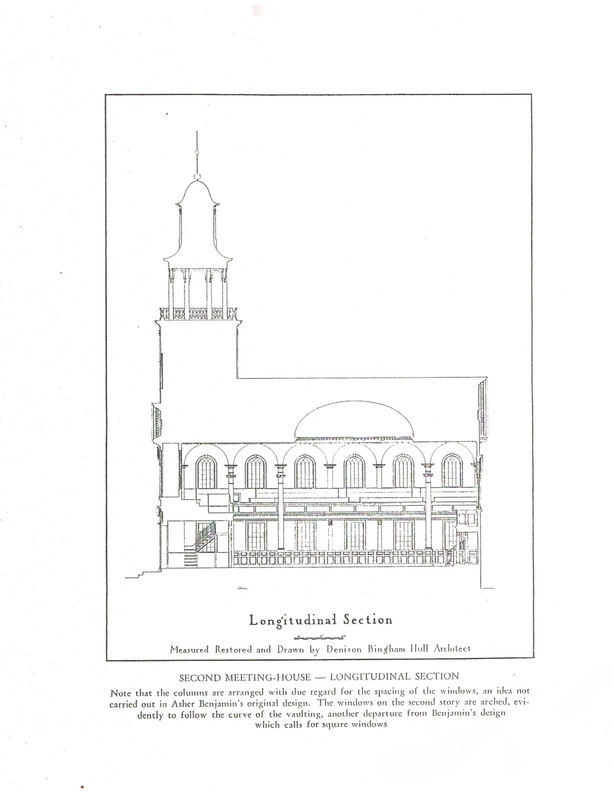 Glenn M. Andres in his article, "Architectural elegance: Lavius Fillmore's Refinement of the New England Meeting House", The Walloomsack Review, the journal of the Bennington Museum, Volume 2, October 2009, says the church committee drew up the plan: The meeting house would be "70 feet by 52 feet with porch, cupola and tower". The framing system was timber post and beam. His partner, Oliver Abel, would be the carpenter and joiner. The layout was the usual: 1) A two story meeting space - the sanctuary - with a raised pulpit for sermons. Families sat on the main floor. The balconies had sections for young men, young women, servants, people of color, and prisoners, and 2) An entry - the porch - for protection against the weather, for late comers and after meeting mingling. In the drawing, the porch is under the the steeple, the sanctuary itself to the right. Note the dome over the center. This church in 1805 felt the congregation itself, the gathered body of those who believed, to be its focus. Church services were held in the morning and continued in the afternoon on Sunday. The minister's sermons could be 2 hours long. The congregation often spoke as well. The acoustics of the space were thus very important. Could Lavius Fillmore create an interior where the minister could preach, the congregation participate, and everyone hear? The traditional solution had been a sounding board - a six ft. diameter solid wood wheel that hung about 4 feet above the preacher to bounce his voice out toward the people in the pews. Fillmore had been experimenting with acoustics in the churches he built in Connecticut, constructed domes of various shapes to bounce the sound. Here in Bennington he could try again. Note that the dome is not a semi-sphere. Its cross section is an ellipse. A half circle would bounce the sound from a speaker to only one place, as a mirror does light. An ellipse could send the sound in many different directions. And so it does. Today, 200 years later, someone speaking in the church can be heard by everyone else, whether that speaker is in the pulpit or in a pew. This dome, its shape, placement, and support seems to me to be to be the place where the design began. The sanctuary is a wonderful space to hear music. In 1805, singing was mostly a cappella. Instruments were hand held - flute, viola, harp, horn, drum - no organ or piano. Hymn writing and singing was just beginning. I am not sure music would have been considered in the design. 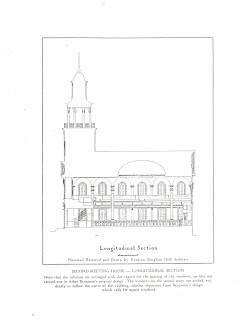 The illustration is "Measured Restored and Drawn by Denison Bingham Hull, Architect". Hull was the architect who restored the building in 1936.